The New Hanover County Arboretum is a lush and peaceful seven-acre retreat deeply rooted in the Wilmington community. Between the large water feature full of colorful koi, to the Japanese gardens complete with a tea house, the Arboretum is the perfect place to spend the day relaxing and enjoying local flora. For nearly 30 years, the Arboretum has been educating locals on the finer points of horticulture. The annual plant sale is one of the many events that helps fund the Arboretum. The success of these events is integral to the Arboretum’s ability to survive and thrive, continuing their tradition as a valued resource in the gardening community here in Wilmington. As supporters of this community staple, the Sage Island team jumped at the opportunity to work with them on the upcoming annual plant sale. 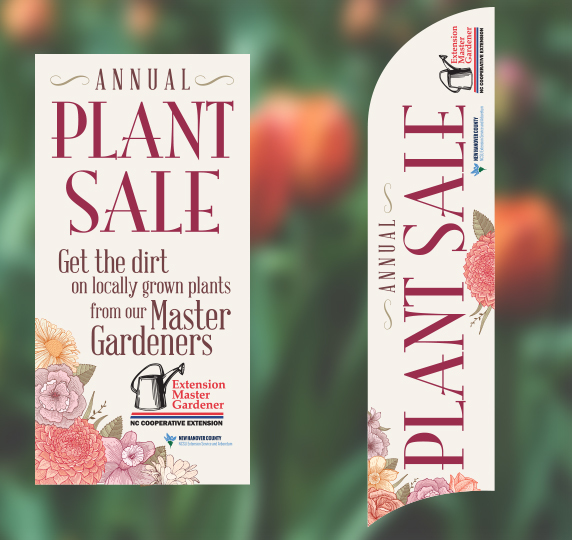 To help promote the Arboretum’s Master Gardener Plant Sale, Sage Island’s graphic designers created several promotional materials, including flyers, feather banners and pole flags. The plant sale is a highly anticipated even that runs for five days every spring, so outdoor marketing is essential to this fundraiser. The flag and banner contain a whimsical font and charming graphics that capture the essence of the gardens and the lavish plant inventory. The color scheme beautifully represents spring and the tranquility of the Arboretum, but is also bold enough to capture its audiences’ attention. The flyer also serves as an important piece to this campaign. Not only is it engaging, it is informative. The result is a compact flyer for the patron on the go, which is pleasing to the eye and easy to read. The reader gets only the essential facts with beautiful but simple graphics to prevent information overload. We carried a similar look throughout the flags and flyers. This helps create a strong identify and a cohesive look and feel for the event. By utilizing these traditional pieces of marketing, the Arboretum and its plant sale can appeal to more potential customers and ultimately reach their goal of funding important local gardening programs. We hope this event continues to grow for many years to come!